Zika Virus is Spreading – Are You Concerned? The recent information about information about zika virus is very alarming. I would like to bring you up to date about the dangers and a natural solution. First of all, here in California, we are susceptible, because the vector, the tiger mosquito is endemic here. 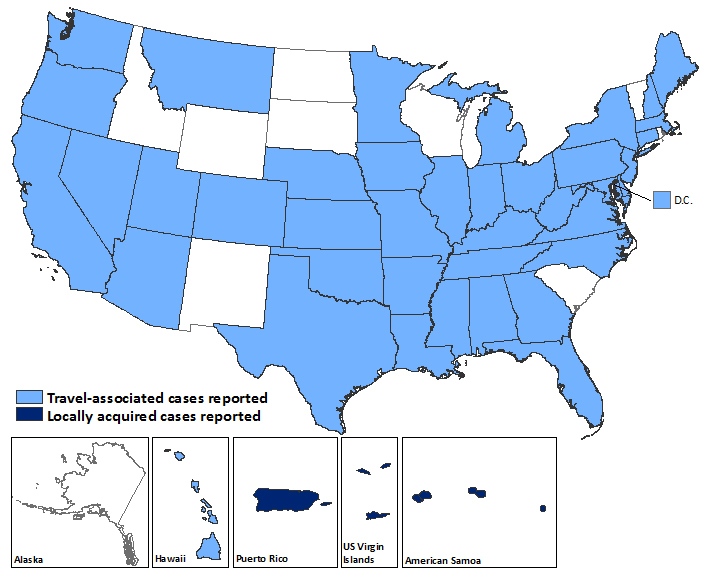 The map below indicates reported cases. (data from Scientific American) The darker the color, the greater the number of cases. Specifically, here in California 6 cases have been reported (2 from 2015 and the rest from 2013 and 2014). The problem is that, with the prevalence of the mosquito in this area, an infected person can be bitten and pass the virus to others. The following information is also from the CDC. The incubation period is unknown, but is probably a few days to a week. The danger is that during the first week of the infection, if you get bitten by a mosquito, that mosquito can then pass the virus to the next people it bites. The CDC reports the distribution of zika in the U.S. on the following map. There have been a total of 354 cases reported in the U.S. currently, primarily travel related. This is, of course, an epidemiologist’s nightmare. I remember when I was attending USC in the late 1960’s. Our bacteriology professor had worked for the World Health Organization and was very concerned about Vietnamese malaria coming to the U.S. with returning servicemen. The problem with the Vietnamese strain was that it did not respond to synthetic quinine products; only the natural extract would do. And, the U.S. had just sold off all of its natural stores, now that a synthesized pharmaceutical was available! Fortunately, that scenario never developed, but we are now in the midst of a similar, and far worse, one. However, there is good news! It turns out that zika is an encapsulated, RNA virus, much like West Nile Virus. Therefore, it too is susceptible to medical grade St. John’s Wort from Medi-Herb. Read my prior article here on my blog regarding the efficacy of St. John’s Wort for a variety of viral diseases. Please remember: the over the counter preparations don’t work, because they aren’t extracted properly and don’t preserve the anti-viral compound. The dose is 2 tablets, 3 times per day, for a week to 10 days. Prophylaxis (prevention) is 2, 2 times per day. I take it regularly due to my susceptibility to shingles. I always have some on hand, so don’t hesitate to call if you need it. The actual number (23,000 estimated) is far less than the number of side effects from prescription drugs (4.5 million), not to mention the number of deaths (37,485). Furthermore, it states in the article that since 150 million Americans take dietary supplements each year, the incidence of side effects is less than 1/10th of 1%. This “study” was actually a medical records review where doctors had noted that they believed that the symptoms had been caused by a dietary supplement. In my experience, since medical doctors know absolutely nothing about dietary supplements, they always try to lay the blame on whatever supplement someone is taking. Therefore, the records being “analyzed” were flawed from the start. The only item I agree with in this entire article is that you do need to be careful about the source of your supplements. One lady was taking a weight loss supplement that upon testing was found to be “spiked with drugs.” It isn’t exactly fair to call that an adverse reaction to a supplement, is it? It was actually because of the drug contamination. Purchasing your supplements from reputable, professional suppliers where purity is assured it your best choice. I have mentioned this before, but it bears repeating. A friend of mine, Dr. William Cockburn America’s leading expert on thermography, contacted WebMD and offered to provide them with a scholarly article on the uses and benefits of thermography. He was told that WebMD’s mission was to counteract all of the “false” information generated on the Internet about alternative medicine and, therefore, they were not interested in anything he wrote. Remember that when you hear every news outlet citing the latest anti-vitamin headline ripped right from the pages of WebMD. I have had their feed on my home page for years; and I can assure you it happens practically every week. For centuries, Pacific Islanders have been using Kava to socialize, relax and relieve fatigue anxiety. It was brought to the attention of the Western world in 1768, when Captain James Cook described its use in his account of his voyage to the South Seas. After a kava party, a deep restful sleep ensues, from which the user awakens the next morning refreshed and without a hangover. When European pharmaceutical manufacturers wanted to capitalize on kava, they did not remain true to the traditional method of screening kava rootstocks and preparing them – basically as a water-based extraction. Instead, they abandoned the noble cultivars and sampled a variety of strains, choosing the ones that had the highest concentration of what they considered the “active ingredients.” They then forced the Islanders to grow only those strains, which made the people quite unhappy, by the way. Then, they added insult to injury by chemically extracting and concentrating what they thought of as the “valuable” compounds. The result was inevitable. Several patients in Europe had severe liver damage and as a result, insurance companies imposed heavy premiums on any company wanting to produce and distribute kava. In essence, the insurers banned the distribution of kava. Kava has not been shown to interfere with daily activities like operating machines or driving. It does not affect performance parameters, such as stress tolerance, vigilance and motor coordination. It is also not habit forming, making it much safer than prescription drugs prescribed for similar usage. There are some contraindications to its use, however. Pregnant or nursing women should not use it; nor should anyone with pre-existing liver disease. In addition, anyone diagnosed with Parkinsonism, or who are taking l-dopa or other drugs prescribed for Parkinson’s disease should not take kava. Finally, there have been isolated reports of interactions with benzodiazepine drugs. Therefore, to utilize kava, which is much safer than benzodiazepines because it is not habit forming, you would need to stop the Xanax or any other drug of that class. A typical, safe dosage of Kava Forte would be 2 tablets twice daily. You can call the office and order a trial bottle if you think it would be helpful to you.